While the bits of Beatles memorabilia auctioned off in recent years have largely pertained to their musical output, one of the latest items set to be sold is an old school notebook that once belonged to Paul McCartney. U.K. auction house Omega Auctions is set to auction McCartney's English Literature notebook from 1959 as part of its "The Beatles Collection: Memorabilia & Vinyl Records" auction, set to take place March 26. The book is expected to fetch between £4,000 and £6,000 (around $7,000 to $10,000 CAD), with the starting bid set at £3,000 (around $5,000 CAD). 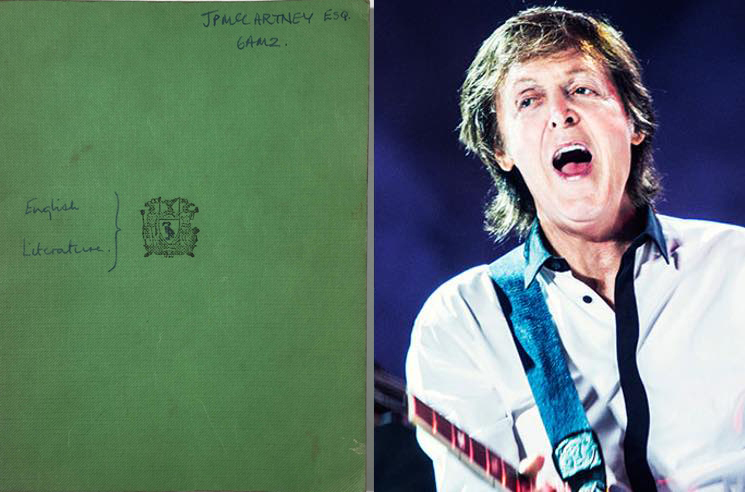 UPDATE (3/26, 1:50 p.m. EDT): McCartney's school book sold for an impressive £46,800 (or nearly $83,000 CAD). That's 10 times the estimate originally placed on the item. The green notebook (seen above) contains English essays and notes written by the Beatle at age 17, when he was attending Liverpool Institute High School for Boys. The notebook features 22 pages of essays on books including Thomas Hardy's The Return of the Native and John Milton's Paradise Lost. All five essays found in the notebook have also been marked by McCartney's teacher, Alan "Dusty" Durband, who gave the future star's work "a mixed collection of very respectable B's from B++ to B-." We're thankful that McCartney found songwriting instead of becoming an essayist. Omega Auctions also notes there are four pages of notes on the essays at the back, in addition to "a doodle of a man smoking on the reverse." You can see more photos of the notebook here. Earlier this year, McCartney announced a Vancouver show set for this July. He also delivered new single "Get Enough" at the top of this year.